Weybridge Sailing Club is located on land owned by Elmbridge Borough Council. Ordnance Survey maps after 1960 show a jointly shared clubhouse with the Tennis Club. Several employees of the construction company, J L Kier in Victoria, London were interested in sport and decided to look for a suitable place to form a company social club. The Kier Company Social Club was founded and the first members included Mogens Kier and Percy Lord (first Commodore). Some disused premises were found at Weybridge and these were taken over in about 1960 or 1961. This club essentially became the Kier Sailing and Tennis Club. In February 1962, two parcels of land jointly called Dorney Gardens (after a local large property Dorney House, now demolished) were purchased by Walton UDC from a local Weybridge man – Cyril Miller. The larger parcel is now the home of the tennis and sailing club and the other is the nearby open riverside space where Elmbridge Canoe Club has their clubhouse. After the acquisition of the land, Walton UDC took steps to regularise Kier’s occupation of the land and, in 1962 through a formal agreement, there was a requirement to change the club name. Weybridge Lawn Tennis Club and Weybridge Sailing Club were created and membership made available to those other than Kier employees. Mogens Keir then became the first Commodore of the now formalised Weybridge Sailing Club. After 2 or 3 years, Kiers began their move from Victoria to the current headquarters at Tempsford Hall near Sandy in Bedfordshire and at this point Kiers withdrew their involvement with Weybridge Sailing Club. The Lawn Tennis and Sailing clubs developed independently for many years and, although initially sharing use of the same clubhouse building, the Sailing Club has had a succession of separate clubhouse buildings culminating in the very functional building we occupy today. 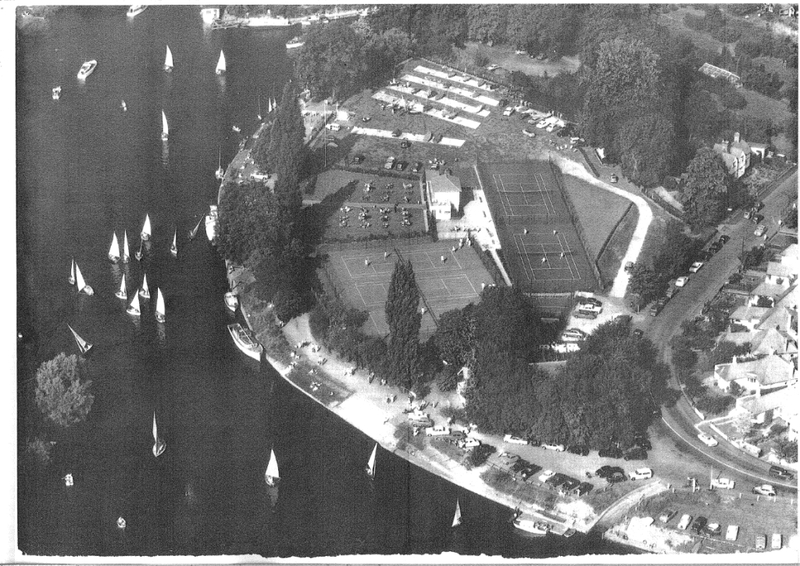 Even today, the local maps describe the building that is now entirely used by the Weybridge Lawn Tennis Club as “Weybridge Sailing and Tennis Club”. The Sailing Club continued to thrive up to the late 1980’s when membership declined. The Club continued through the 1990’s but it was clear changes needed to be made. This prompted our club ethos to evolve, diversifying from a solely sailing venue and adapt to prevailing boating needs. In so doing, we have successfully created something very different in Elmbridge and unique for a Thames side boating club. We have a strong desire to remain unique and Members appreciate their freedom to take part in their boating pleasures at their own pace and at a time that best suits them. Weybridge Sailing Club celebrated its Golden Jubilee year in 2012. In recent years, membership has been maintained at a good level enabling us to enhance the facilities at the club and make it more attractive to new members who want to enjoy leisure time on the river.